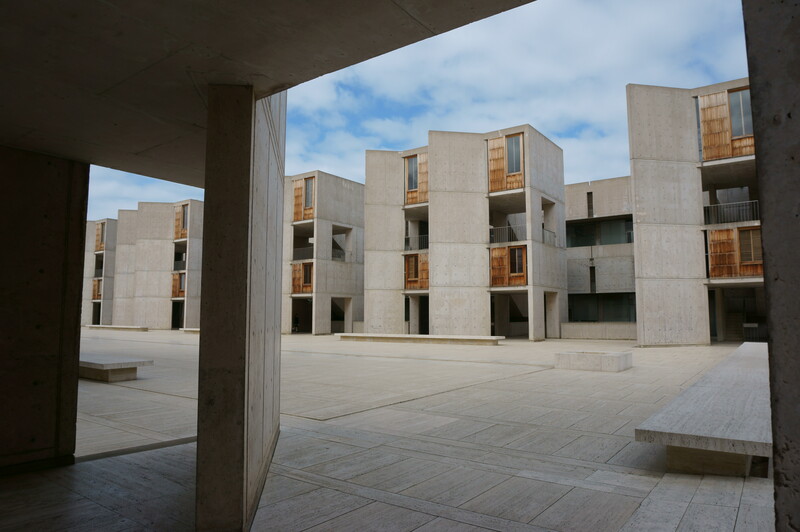 Salk institute of Biological science. For Biochemists, it is a great institute for biomedical research, but it is also known for its Architecture co-designed by Louis Khan. I spent some time exploring the place yesterday, took the liberty to see how the architecture combines with the functionality it carries out. The architect was obviously designing for an open lab space where transparent glass windows dominates most of the lab space, and at the same time the compact lab space is promoting an environment of busy, close relationship of lab-workers. 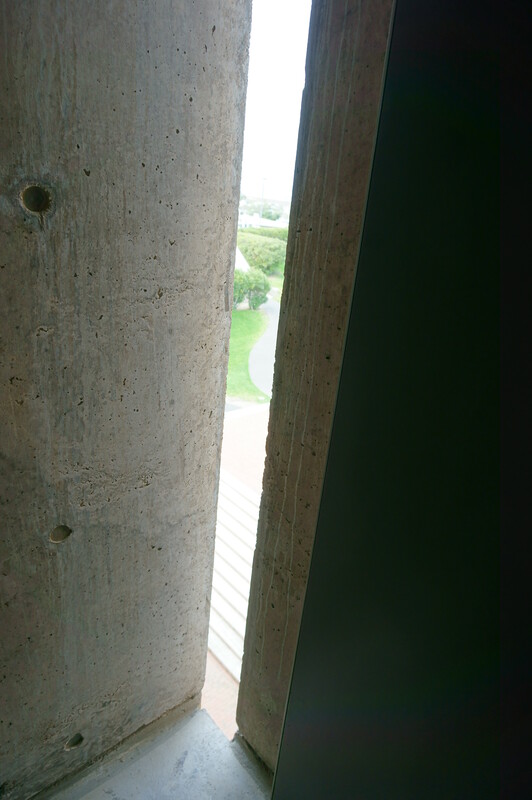 Even the stairways were designed to be narrow, to provide more space for the “space”. provides a unique view that looks as if the building is the entire landscape. 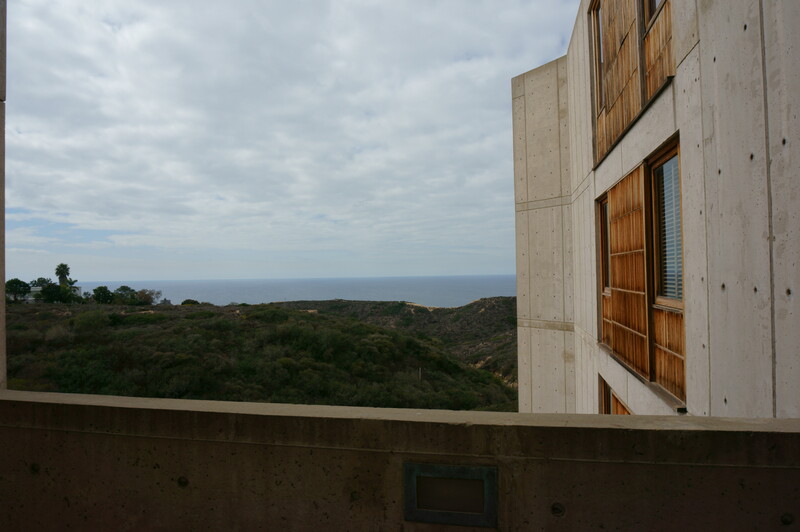 The space in between gives the impression the pacific ocean is readily close. The central space changes the “purity” of the landscape once you step into it. The alteration of the landscape is really the essence of the whole structure. Unfortunately, the design does not readily transfer into the functionality of the institute. The compact space is in direct conflict with the generous space provided for the PIs of the research labs. Behind each of the wooden cover houses a large office for a PI while the lab environment is so crammed, that you see every corner of the lab space is placed with all sorts of stuff. The lab benches are filled and the researches actually went to a different building for meetings or seminars. The building have openings for the flow of air. Standing anywhere in the hallway, one can feel the air flow. The building is great in terms of its outside space. 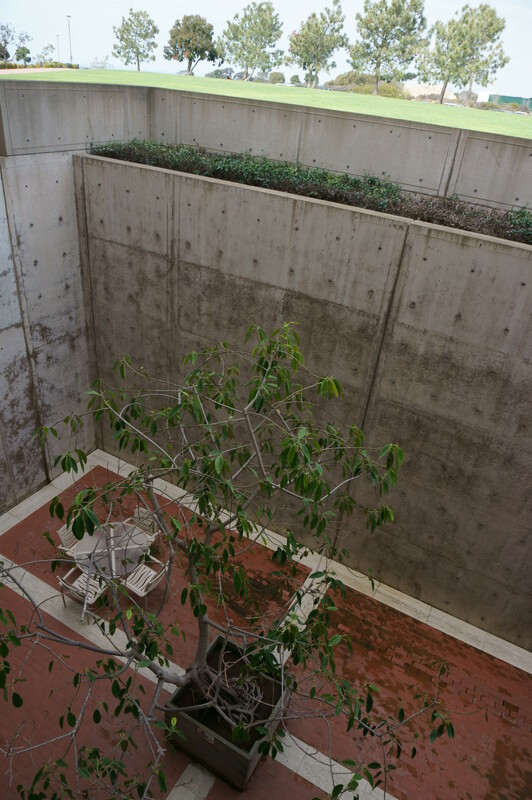 For example, the building provides great resting areas outside. Unfortunately, these spaces are not in effect functional. The direct cause of the waste of design is because of these areas are specially devoted to “resting”. 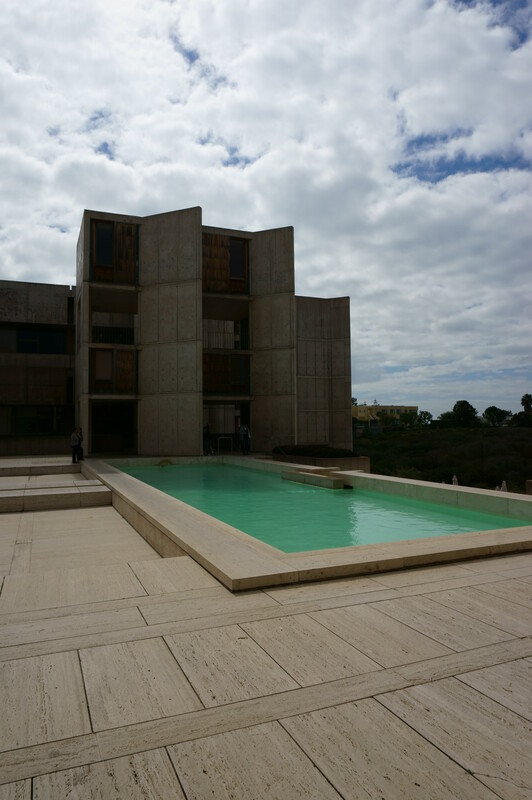 They are “isolated” and remote, while you see people socialize elsewhere such as close to the fountain pool that appears to be more open and approachable. 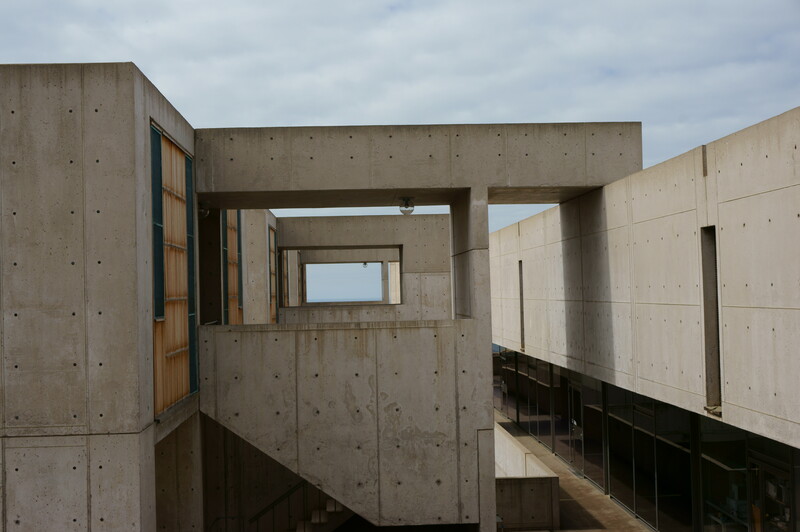 I have to say, Salk institute is a great architecture for its time, its design isolates PIs from their labs, labs from the landscape, while crammed lab spaces isolated from the space outside from the inside by transparent glass walls. There is absolutely no space outside any lab for the display of information nor presentation of lab achievements, and thus does not really represent an ideal environment for present day scientists. Maybe the architect of design could not understand how much time a scientists really spend inside, and thus I have to say, it is a great piece for architects, but it is definitely not an ideal place imagine yourself working in. The functionality of the architect is somewhat detached from its reality, and it is not easy to realize that the current day trend of lab design is really moving away from the ideals of Louis Khan, where the outside space is the key focus. Posted on 2014/02/27, in LIFE, 文字. Bookmark the permalink. Leave a comment.